When I decided to travel around Michigan’s Upper Peninsula during July, I knew I’d see lots of people being active outdoors. After all, the summers are so short here. I was not disappointed. People are out running, hiking, biking, canoeing, even surfing at Presque Isle, near Marquette, on a windy day. What surprised me is that most people we talk to actually look forward to winter, because then the REAL sports begin – from skiing to snow boarding to ice fishing and so forth. But yesterday, while at a wine tasting in Munising, I learned about a new type of competitive sports event: an ice climbing festival. WHAT??? It seems that ice climbing has become a very popular sport along the Pictured Rocks area of Lake Superior, where ample lake effect snow, numerous waterfalls, porous sandstone cliffs, and the water which seeps out of the rock layers, form curtains and columns of ice suitable for climbing. 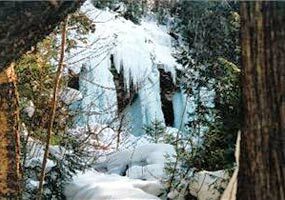 The most accessible ice columns are found along the Pictured Rocks escarpment between Munising Falls and Sand Point along Sand Point Road, where ice columns and blue ice curtains are 20-50 feet high. Held in February, the Michigan Ice Fest brings hundreds of the best ice climbers from throughout the world, but there are lots of locals who take part, including the lady who poured our wine, who also happens to be the organizer of a local cross country ski group. Demonstrations and climbing courses are part of the event. For more information, visit www.michiganicefest.com.